Rebecca moved to Italy from Chicago in 1993 and shortly thereafter opened an agriturismo in her husband’s renovated family farmhouse at the foot of Mount Subasio near Assisi, Umbria. When she’s not with her two sons, she spends her time taking care of guests at Brigolante, blogging about the lovely region she now calls home at Rebecca’s Ruminations, and wondering about what strange winds blew an urban vegetarian to a pig farm in Umbria. There are certain things we tell ourselves, we promise ourselves, we solemnly vow to ourselves, when we become parents. Our children will never get parked in front of the TV. Our children will never play with war toys. Our children will never eat sugary breakfast cereal, especially not directly out of the box. Our children will never change the way we travel. All of these are ridiculous, we discover disconcertingly early into the parenting adventure. Sooner or later you need to shower in peace, which is why God created the Disney movie. Sooner or later you realize that even if you nix the water guns, your sons will build pistols out of Legos. Sooner or later you remember that one of the pure joys of childhood is illicitly eating fistfuls of Cocoa Pebbles, especially directly out of the box. And sooner or later your kids change the way you travel. Sometimes, it’s not a particularly positive change (I once ran out of diapers on a Sunday night on Mykonos. Yes, I can feel you shuddering. ), but other times – most times, even — our kids change the way we travel in the same way they change the way we see the world. They slow us down, make us cut out the superfluous, help us live in the moment. This is one of the benefits of travelling to Umbria with kids. Adjusting your pace and fitting in activities that will make the trip memorable to your entire family gives you the opportunity to experience this beautiful Italian region in a way that running the usual church/museum relay doesn’t. Here are five suggestions for activities in Umbria that are fun for everyone — and may give you enough bargaining power to get them to tour just one more church! Umbria is known as the green heart of Italy and and its lush vegetation is the result of the ample annual precipitation which falls in this region…so there’s no lack of lakes and rivers to both amuse your kids and cool them off when the temperature starts rising. You can head to tranquil Lake Trasimeno for a swim from one of the beaches, or take the ferry to tiny Isola Maggiore in the middle of the lake. Consider visiting the beautiful Marmore Waterfall in the south of Umbria; the trail which skirts the falls is so close that at times you get a refreshing natural spray. Also in the south, you can spend a day white water rafting with outfitters on either the Nera or Corna rivers … the last run we did was with a group of people from 5 to 60 years old, and everyone had a blast. On almost every hilltop in Umbria there is a hill town, and above of almost every hill town there is a castle! Nothing is more fun than exploring a castle for aspiring princes and princesses (and nothing prettier than the views from the strategic vantage-points for their parental kings and queens). The best castle in Umbria for kids to conquer is by far the Rocca Maggiore in Assisi. Only partly restored, this stone fortress has tunnels, towers, and turrets galore. More staid, but still fun to visit, are the Castello del Leone in Castiglione del Lago and the Rocca Albornoziana in Spoleto. If you really want a fun window into Umbria, hit the nearest sagra for dinner. A sagra is a festival organized by a community which centers around a specific food or dish – generally local specialties, e.g. truffles or wild boar or torta al testo (a type of flat bread) and is publicized primarily with the big posters plastered along the roads and in the main squares. A benign pandemonium reigns at these festivals, where you’ll find a booth where you order your food, a big tent where you sit at long tables to eat, a couple of carnival type games where you can shoot cans or play the lottery for prizes, and a dance floor. It’s the kind of event where anything goes, so until the band starts up let your kids run completely wild with the other roughly hundred children tearing around the dance floor, give them some money to win kitschy crap at the lottery booth, sell your soul to the devil and buy them something God-awful at the confectionary truck, let them ride the two or three rickety carnival rides set up behind the dance floor. Your most memorable experience in Italy will doubtless have to do with art, culture, or food. Theirs will be the night you took them to the sagra. Kids can only take so many museums, churches, and historical monuments. Now that I think about it, most of us can only take so many museums, churches, and historical monuments. So as long as you’re in one of the most beautifully green places in Italy, skip the culture for a day and instead head to one of the many parks in the region. You can walk or hike, picnic, swim, enjoy a scenic drive, or just simply relax and enjoy the view while the kids are able to blow off some vacation steam. Some of my favorite places in Umbria are the Piano Grande in the Mount Sibilline National Park (where there are horse and donkey riding excursions), and the Mount Subasio and Mount Cucco Regional Parks. If your kids really have some steam to blow off, you can treat them to a day at ActivoPark near Terni which offers tubing, donkey rides, climbing routes and mounting biking rails, go-karts and rollerblading. Yikes! Not that school — I mean the fun kind. There are lots of opportunities to take day courses in Umbria which can be customized for family groups. Try learning how to make ravioli and tiramisù with a local cook who knows how to get even the young ones rolling out dough. Enroll your family in Perugina’s School of Chocolate (see, I told you I meant the fun kind) for a day of making delectable desserts. Head out with a guide and dog to sniff out truffles in the Umbrian woods. Bring out the artist in everyone by creating your own majolica pieces with a master in Deruta. With a little creativity, research, and advance planning, in Umbria you can experience one of your memorable — and fun – family trips. Come and discover what Italy’s Green Heart has to offer! 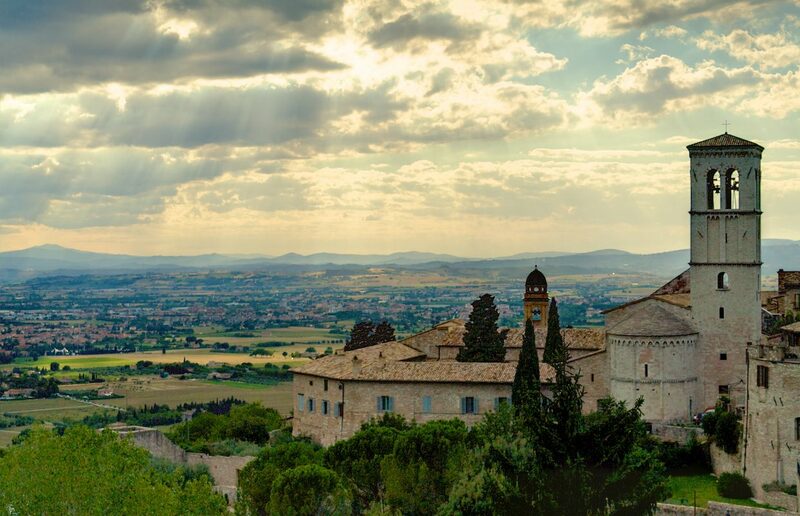 Need help planning a trip to Umbria or anywhere else in Italy? Our Family Vacation Planning Service can help! Request assistance on My Trip Planner. Travelling with my 2 daughters surely had changed the way I see the world … and I love it! Rebecca, you summed up so well what to do in Umbria with children! Rafting seems to be one of the best activities so far! Thank you for this great post and details!! Hi Fiona! 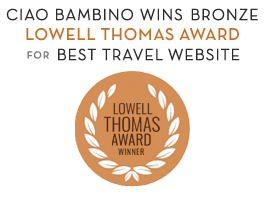 Thank you for using Ciao Bambino as a travel resource. We are excited to help you plan this wonderful family holiday. We will private message you shortly. I love your article and can relate so much. Especially the first parts: no TV, no sugary cereal and travel. So funny and true. Thank you for all the tips on Umbria. Can’t wait for our trip in the spring!